Hey, who survived Kita wars last January? Me and my boyfriend are happy to announce we will be attending again this year. I have already got my cosplays decided and even making some damn good progress this year! We will be staying at the Scarman. I have managed to get Akari Kanzaki from Battle Athletes Victory done for LAGC February this year. 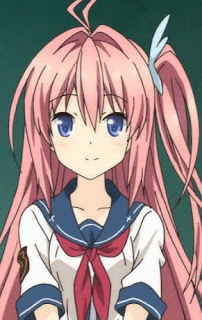 Sadly I don't have many pics yet so I dont plan to do a 'Lets Cosplay' of her until I get a shoot done. She was a pretty simple one to make, with it being no more than a crop top and a leotard. Hopefully pics when the weather warms up. Just to make it clear, I never really felt that I really fitted in into the AL events. I always felt out of place, and to be honest I felt that I belonged in the bar with double vodka in my cup more than I did on the main floor. I needed a little alcohol just to feel relaxed and from experience it seemed to attracted mostly the less experienced (and even more so lesser polite) crowd. After the recent events concerning Mike Towers I am even more so hesitant to go anywhere near the events unless some certain major changes happen. Now, I don't enjoy being negative about events but to be honest I had more fun drinking in the hotel room in my underwear than spending several hours per day at a number of days at AL events. A week later I was rota'd off work the following Saturday which conveniently fell on the day where Midlands Expo was happening in Telford, We both had some extra cash so we decided to go. It was much, much, much more relaxing than LAGC. We had done LadyNoir again. Not much can be said about the con itself, just a slow day relaxing and taking it easy with the one I love. My next event would probably be Em-con, Nottingham. Being my home city I wish to have a costume that slightly obscures my face while giving Ladybug a little break unless my plans don't go ahead for whatever reason. I have recently gotten into Yuri on Ice!! 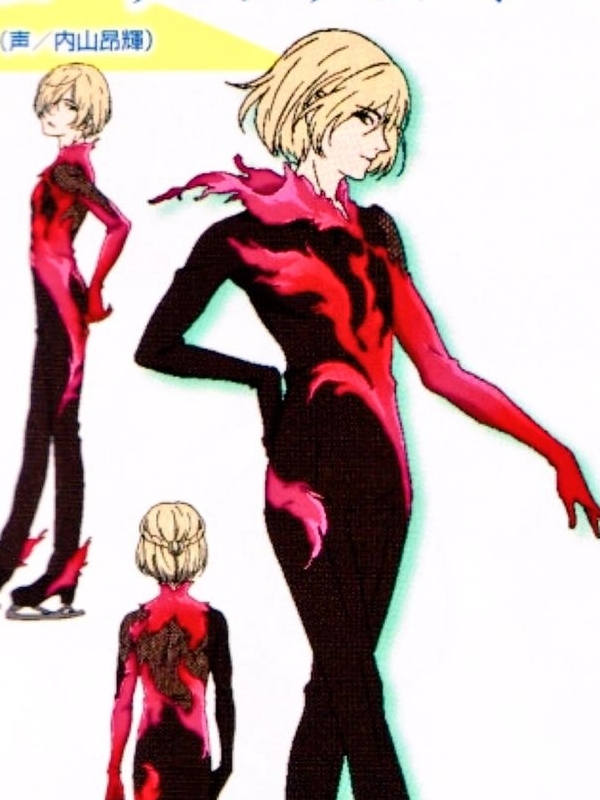 and fell in love with Yurio's Allegro Appassionato costume. I am currently in the process of gathering the materials for the bodysuit (pictured) and experimenting with adding the ombre effect on scraps for the applique, Being metallic Spandex it may be easier said than done but looking at other cosplayers the suit should look stunning even without the pretty effects. I am also doing the track jacket for something comfortable to change into when I need something easier to wear. 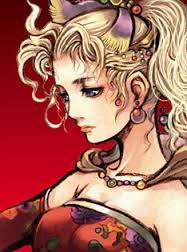 My other big costume will be Terra from Final Fantasy 6. 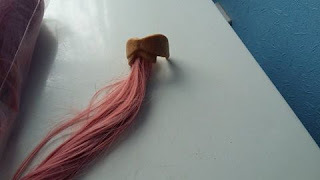 I have managed to tie the wig into a high ponytail and in the progress of making the hair accessories. I have a number of ways I am considering the floral design but you will have to wait and see how that turns out! 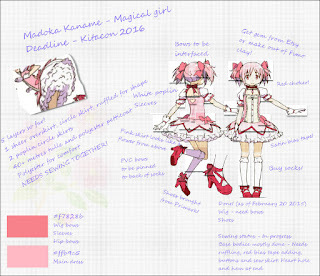 I plan to debut her at Kitacon Quest. 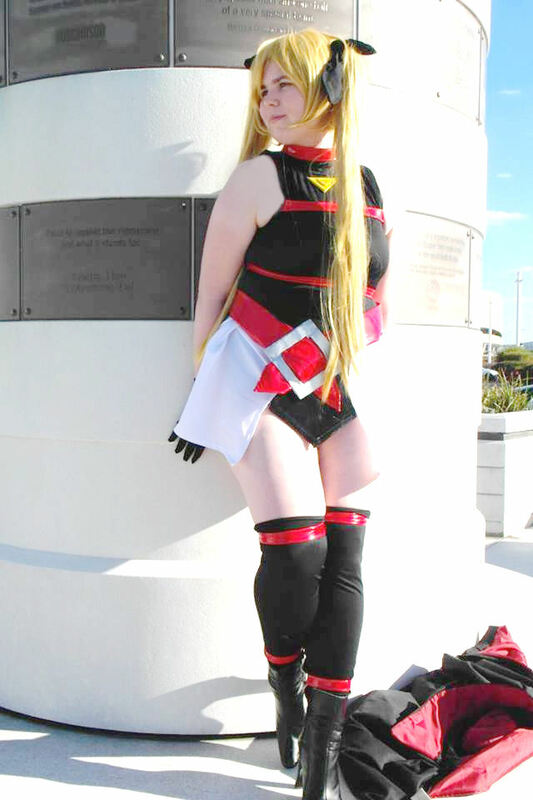 I am also working on Asuka's yellow dress from Evangelion for something easy to wear if the weather get warm. Of course, Ladybug will be returning to Kitacon! It has been a pretty long week, hasn't it?. In an attempt to lighten the mood up a little I have decided to give it a shot at doing a wig review. 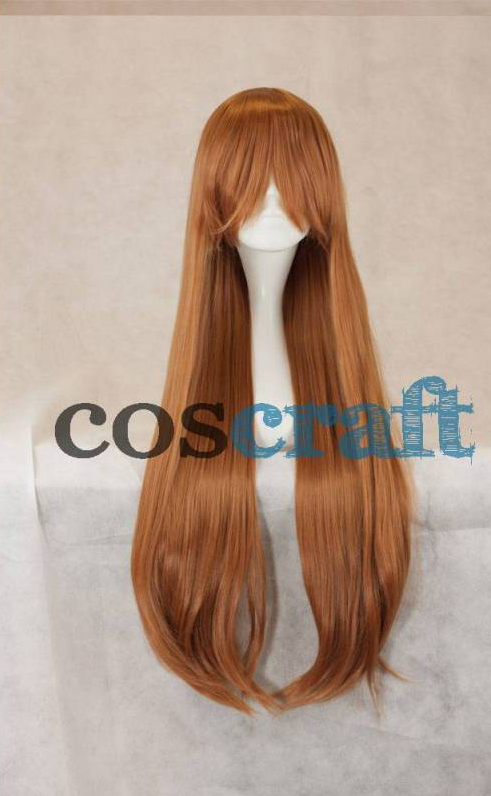 Once again I have went straight onto Coscraft for my latest wig. I compared the colours and decided this wig in particular would be suitable. There is a number of reasons why I chose to get my wigs from there. For starters, I have ordered from them a number of times and the service has always been phenomenal. It never takes more than a couple of days before my orders arrived at my door. Secondly, the quality of the wigs have always been very nice. Although they can be a little bit on the thin side, they actually feel nice and from experience they have been pretty lasting. Thirdly, they dont cost an arm and a leg. On average, a very good quality wig should cost anywhere above £20. I also have a Alex wig in Milkshake pink and they both only costed around £22. Lets not forget the sheer variety of styles and colours they have. For additional styling, they have wefts and due to each shade having their own name it is very easy to just pop on the site at anytime and order them. It was a very pleasant surprise when I popped mine out of the bag. All the wigs I have brought there have been Milkshake pink, an Alex, a Lily and a Ash (apparently, pink is pretty much my signature wig colour) so it was my first time going for a more natural shade. The wig itself feels very soft and silky (actually it somehow feels nice than the other wigs I got from there for some reason). The colour is beautiful and vibrant, although it does seem to lack highlights to give it a slightly more natural look. After posting the pics on my Facebook page I have been getting comments from people in real life that they legit thought it was my real hair and it has grown and been dyed all of a sudden. Overall, I am very satisfied with this wig. 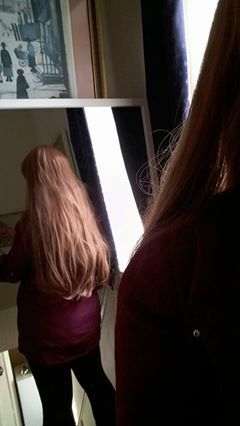 The wig has been very easy to trim and I am very much looking forward to styling it further when my sewing space finishes it's renovations. Coscraft, you have done it again! Thank you so much! Ao no Kanata no Four Rhythm - Asuka's wig! Wigs are defiantly something I would love to have more experience with. 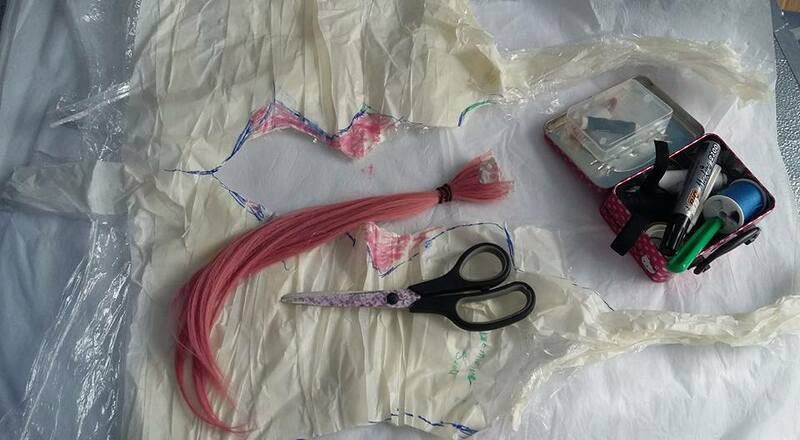 When I started out on cosplay I was actually terrified at the thought of even leaving a wig in the same room as a pair of scissors. All I had the guts to do was braiding, clipping in extensions and putting in hair ties. Now one thing I have been starting to look at is what can I do to achieve certain hairstyles. I am not gonna lie, I still lack confidence to an extent with hair in general but I guess I just need to consider it with a similar mindset to working with fabrics. You just need to be careful to cut it in the right places for the right effect! One thing I have learned over the years is that wigs are not usually ready to wear. In fact, there is a good chance you will need to give it a good trim and cut bangs as they are often around chin-length so they can be worn by different head shapes. I decided that Asuka would be a fun cosplay to put together and although the costume itself is still in the works, the wig is now done. 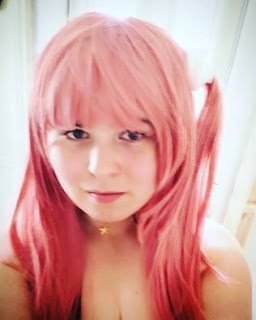 I have ordered a 'Alex in Milkshake pink' wig from Coscraft. The bangs were cut and the sides were cut off just above the shoulders. The longer cut-off were kept to one side while I gave the wig a good spray for added volume and a slightly untidy look. I looked online for various tutorials and read a large number of forum posts and decided to go for the caulking method. Sadly I don't have any process pictures but if you looks up 'Wig caulking' there will be a number of tutorials to help you out. It is basically a process that allows you to make your own wefts. You carefully line your wig strands evenly on a line of masking tape and pop some watered-down decorator's caulk. I had made the mistake of using the type that does now clear but shush :P the hairclip covers it! I rolled them and sewed them together to create a chunk of hair. This part was actually pretty simple. 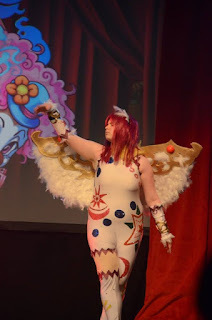 I began by getting some left over craft foam and shaped then cutting them into wings.I made 2 wings, 1 with the smaller part missing so they overlap and have more of a 3D feel. I took a artist license to this as the wings should have been straighter but I felt I would like to cover where the extension and clips are so thermoformed them to be rounder. I made a cup so the wefts could fit snuggly in it for extra security and scavenged a clip from a cheap child's hairpin to attach it to the rest of the wig! it is then painted white and varnished with PVA glue! Convention registration - Getting in! Demand for the most popular anime conventions can be surprisingly high. While less-known events can take months to sell out, it has been known for the bigger events to sell out in less than A HOUR! Thats right! 1 BLOODY HOUR! Sadly, due to demand increasing with the community getting bigger it can be harder to attend some events. What can be done? no need for a stampede to get in! DO NOT WAIT UNTIL LAST MINUTE! This step takes initiative and research. There is no point signing up and paying for a con you might not be able to make due to the high travel costs where you might end up missing out on a event closer to home. Be sure to plan ahead what are realistic destinations and look into accommodation. Yes, disagreements may happen, some of your friends might find it too expensive to travel to some events, while some might prefer a smaller con close to home. Then we all have these friends who would rather just go to the major party cons. Dont forget you have this little cousin who is still too young to attend some of the more mature events, but hold the phone! There is a small event the whole family can enjoy in town! This is a handy way of making sure you are up to date with any important announcements regarding sign-up dates and changes regarding these. If you are attending an event for the first time, the better the reputation, the faster it might sell out. Not all is lost, just go onto the waiting list. There will be drop-outs as there will be people who change their minds for one reason or another, You will be contacted if there is a space available for you but remember it is first come first serve. Don't take my word as gospel as each event would have a different set of rules but usually you have 14 days to pay for your entry through PayPal. Failure to do so would result you losing your place and you will have to sign up again. If there is a waiting list you will be placed at the bottom if you reapply. Mein Gott! Is Ellie resurrecting this page from the dead? Well...I had never forgotten about my own little corner of the tinterwebs. In fact, if you have read my more recent posts I can still confirm that I have been pretty busy lately. With me working many hours these days and spending much of my free time with my boyfriend naturally the time for cosplaying has been a little cut, both productively and blogger-wise. I still do my best to update my Facebook Page but even then I still wish I have more time into these things. Without further ado, I am still yet to write about my Fate cosplay. When I was still in school, I have came across an anime called Nanoha Strikers. It was back before I knew the Nanoha franchise also covered days when Nanoha and Fate were younger. As much as I loved the series it wasn't until last year I have watched the earlier seasons and felt there was a little void in my life that was finally filled. 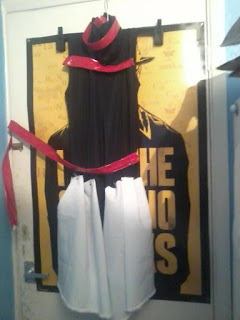 I had some black and white fabric that was lying around, as well as some red PVC so I had decided to give Fate a try. I made a basic black leotard with a zipper in the back that happens to have been where the red straps were sewn into. The bows, leggings and gloves were made of black Spandex and the skirt had a nice Cotton twill feel to it. It was only a bit of scrap material so it was shorter than I would have liked but made it work with some gathering. The front part is attached to some elastic to make it easy to slip off when taking the costume off. The cape is what makes this usually cold cosplay more cosy and this revealing one much less intimidating to wear. It has a nice sheen to it and it is lined with some lovely Maroon coloured Polyester fabric with interfacing inside the collar. The belt buckles and yellow triangles were some left over Worbla that was painted silver. Perhaps surprisingly the most stressful part of the cosplay was waiting for the wig as I have never been blond before. 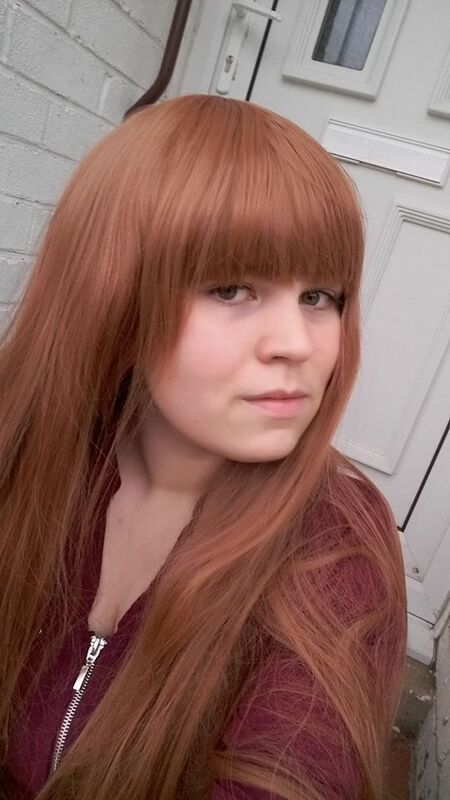 When it arrived it was a very pleasant surprise and have plans to cosplay some other of our yellow-haired friends now I have the confidence to pull of that colour! Fate is far from my more comfortable costumes as the red straps are very constrictive and I normally have to unzip the back a little so I can breathe. She is also among the very few where I get to wear heels. Placing the extensions to the wig can be a challenge within itself but the cape makes this costume somewhat nice to wear. Fate was worn at J-con 2015, Namsoc Halloween night 2015, LAGC Winter 2016 and Alcon 2016. I wish to wear this as I am usually ill or tired when I am in this for some reason. In fact, on the day of Fate's debut I was up until 4am, had 2 hours before the con to sleep and had to rush home for an evening shift at work. Never again! 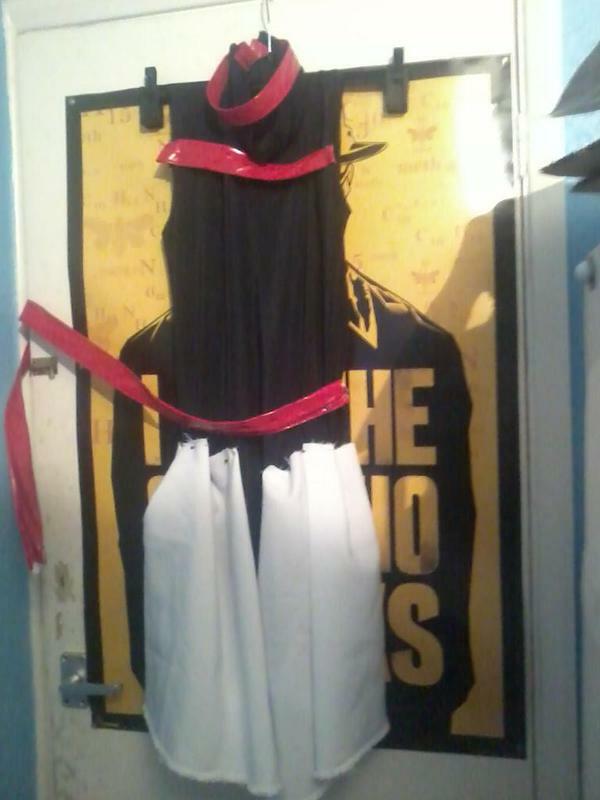 So Kitacon has come and gone Here is my newest cosplay! I love how she turned out and was a massive learning curve. 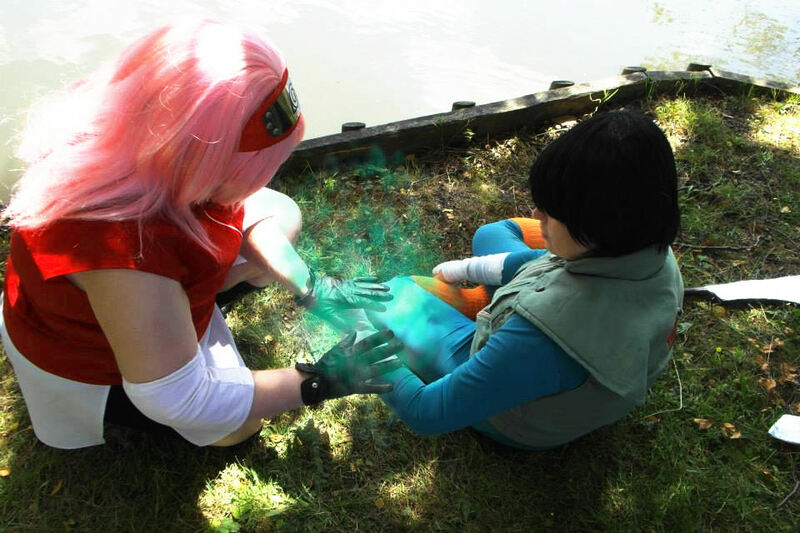 I used my Rock Lee costume as a rough guide for the bodysuit. Once I got it all shaped I used fabric paint to paint on the details. 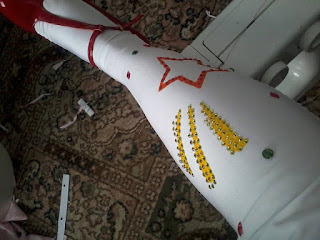 I added some bling by hand gluing rhinestones onto everything that has been painted. I am yet to have a proper estimation of how many there are but as a guess I think there may be well over 3000! Duchess satin and skin toned spandex were used for the finishing touches.The same were used for the sleeves. The wings are a metal mesh base, cut to shape using strong scissors and gaffer taped on the edges for safety (they edges are really sharp!). Cardboard is used on the edged for sturdyness! Over 1000 white feathers are hand glued individually. The details were blue EVA foam cut and spraypainted gold. Polystyrene balls were painted red for the orbs. Thick elastic was used for the harness but if I have more time I would have considered using the PVC piping method. The gold wristlets were made of Worbla thermoformed around craft foam for additional thickness. The crowd was a simple headband with a strip of feathers glued on. Shoes are on sale from Primark and I already owned the wig. Shiny, shiny, na no daaa!!!!!!!!!! I have been dipping in and out of cosplay lately as I have been very busy. I have been balancing work, costume making and being with my boyfriend, and we all know all these take up so much time! At the moment I have been focusing on an ambitious cosplay. I have decided to try to finish Sora from Kaleido Star for Kitacon Karnival! I have completed the paint work back last July but it felt half baked so much of my free time has been dedicated to covering then with rhinestones in the past week. Thats right! Sometimes for the results you want, following just what is shown in the references doesn't always guarantee it would be enough. Sora is a fantastic example of this. There are like perhaps 3 references of a very similar costume design so it was very fun playing around with it as well as adding my own flair. Sora is naturally a very ambitious, shining character so decided to turn an already complex costume into a labor of love. At the moment, much of the rhinestones are sized between 2-4mm. They all/will be glued onto painted Spandex (I used Dylon's fabric paints) individually by hand using tweezers and a seam ripper. I used Api's Crafters Pick Jewel bond to glue them on. Sparkly! Ellie is a British cosplayer, blogger and enthusiast! Written content and artwork done by Ellie Edwards 2014. Some images copyright Google. Watermark theme. Powered by Blogger.